With April, Spring is in the air. 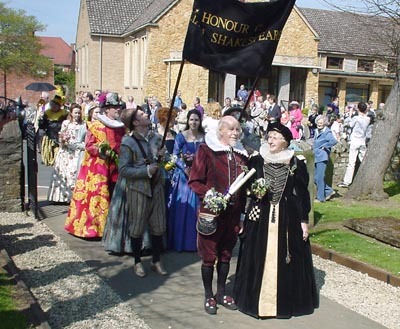 Stratford really comes to life with a wide range of events and activities, crowned by our William Shakespeare Parade. The celebrations are usually held on the Saturday nearest to 23rd April, Shakespeare's birthday. 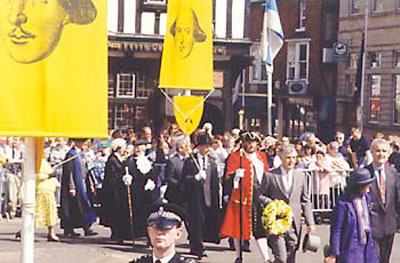 The traditional core events are: a procession to lay floral tributes on William Shakespeare's tomb, a birthday luncheon at which toasts are made to the Immortal Memory of William Shakespeare and to The Theatre, and, in the evening, a birthday performance of one of his plays at the Royal Shakespeare Theatre. Spiritual Adventure  expand your ability to facilitate change. From origins in the eighteenth century Stratford-upon-Avon's Shakespeare birthday celebrations have developed into a unique international occasion which annually brings together people from many countries, institutions and professions to do honour to the immortal memory of William Shakespeare.